I decided after I moved in the summer to make Christmas gifts for my immediate family for Christmas - - - an all handmade Christmas! My mom, dad and sis each got a quilt this year, and now I can finally post about them! I decided to make my Mom a modern Dresden plate quilt using method and inspiration found at Geta's Quilting Studio. I saw her quilt on Pinterest, and just had to make my own. This is a pretty easy quilt to make, using strip pieced wedges. The best part is that you turn the circular Dresden plate into an octagon, and then sew on corner triangles to form a square. Then you can sew the blocks together as normal with a minimal amount of appliqué. The fabrics are all pulled from my stash - and there's a lot of Tula Pink in there, y'all. The background is a white tone-on-tone that I've had lying around for ages and was just right for this. I have to say, I'm uber happy with the quilting, too! I did it myself on Mom's long arm while I was home for Thanksgiving. I locked myself away for several hours and cranked this baby out, tackling swirls for the first time! And seriously, my back hurt for about three days after hunching over this bad boy for so many uninterrupted hours. The backing is some of my favorite from Bonnie and Camille - from the Ruby line. Yum. I love this guy, and I think Mom loves it too, so mission accomplished! I hope she loves wrapping up in it this winter. More gift quilts to come so stay tuned! I hope you all had a lovely holiday, and are looking forward to a happy New Year! Did you get anything handmade for the holidays this year? That is really gorgeous. 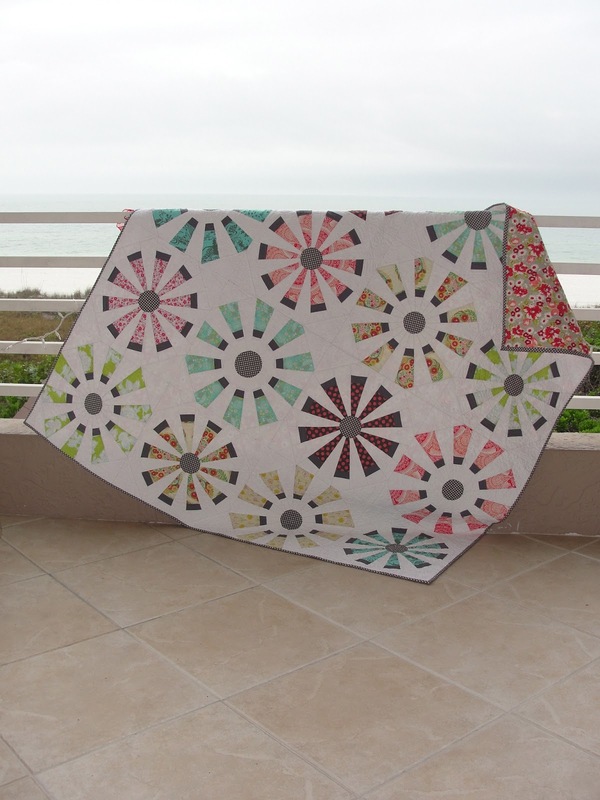 The colors are so soft and pretty and the quilting looks fabulous. Love, love this. I might even try to tackle one. I love this one, Kelly! It's beautiful. It turned out so so cute! It's fabulous! I love the oversized look of the Dresdens.